Ancient Egyptians adored cats for their finesse in killing rodents, as far back as 4,000 years ago. 2. Cats prefer their food at room temperature — not too hot, not too cold. 3. A cat has been mayor of Talkeetna, Alaska for 15 years. His name is Stubbs. 4. Cats can’t taste sweetness… bummer. 5. A cat’s purr may be a form of self-healing, nervousness, or contentment. 6. A cat’s brain is more similar to a human’s than to a dog’s. 7. Cats can pick up on your tone of voice. So sweet-talking to your cat has more of an impact than you think. 8. Rather than nine months, cat pregnancies last about nine weeks. 9. Cats have better long-term memory than dogs. 10. Abraham Lincoln kept four cats in the White House. President Clinton had one named Socks! 11. Cats rub against people to mark their territory. 12. Black cats are bad luck in the United States, but they are good luck in the United Kingdom and Australia. 13. Cats walk like camels and giraffes. They move both of their right feet first, followed by both of their left feet. No other animals walk this way. 14. Cats can spend up to a third of their waking hours grooming. 15. The largest litter of kittens produced 19 kittens. 16. Cat noses are unique, just like human fingerprints. 17. 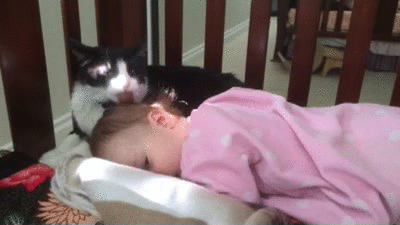 Many cats like to lick their owner’s freshly washed hair. 18. Cats can be toilet trained. 19. When a cat’s tail is shaped like a question mark, it means she wants to play. 20. Webbed feet on a cat? The Peterbald’s got ’em! They make it easy for the cat to get a good grip on things with skill. 21. Cats are the most popular pet in the United States. There are 88 million pet cats and 74 million dogs. So I guess, cats win?